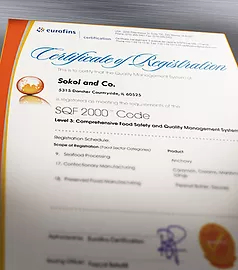 SOKOL provides their customer with the utmost in quality food manufacturing. From the bench top formulation to packaging and storage facilities, SOKOL enables a wide variety of specialty needs. In order to provide you with the best we maintain a Kosher-approved processing facility and are certified SQF 2000 Level 3. Our quality assurance begins with comprehensive, rigorous review of incoming raw materials and continues through manufacturing with routine sampling and testing for proper pH levels, viscosity, color, flavor, microbial testing and sensory testing. The result is a delicious product of impeccable quality for our customers and yours.